This well establish tourist hotel is very well situated in a quiet, yet convenient location enjoying some superb sea views from the garden and pool area and from some of the guest accommodation. The property comprises a detached Victorian property having mainly stone and brick elevations with later additions and alterations. It is currently arranged as 23 en-suite guest rooms, catering for up to 56 guests in a mix of double, twin and family rooms. The accommodation is fully warmed by gas fired central heating and has some uPVC replacement double glazed windows and features a large dining room, an excellent bar/lounge with dance floor facilities, a games room, well appointed kitchens and ancillary rooms and on site car parking for a maximum of 19 vehicles. There is also unrestricted car parking directly outside the hotel. The present owners have run the business for the past 12 years and are now selling owing to their desire to retire and they currently run the business on a B&B and half board basis with the split 50/50 between both types of boarding. The hotel is currently open from April through to October but we feel there is scope to extend the season if required and we also believe that there is scope to open the hotel for private functions, be it celebration parties, small weddings, small conferences etc. The hotel stands at the junction of Eastmount Road and Crescent Road and is only about a 500 yard walk to the beach, the Cliff Path being slightly closer and the attractive Old Village area of the Town being approximately ½ a mile walk. The Town Centre with its good selection of shops and amenities is nearby as is the Railway Station with good connections through to the passenger ferry service at Ryde and onward to the Mainland. 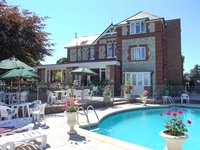 A lovely feature of the hotel is its heated swimming pool and surrounding terrace and there are some super views over Sandown Bay from this area. long entrance hall with original victorian features. Gentleman’s wc with two urinals and one cubicle. Ladies wc with one cubicle. living/bedroom and also to the rear of the bar area. Beauty room with massage table and equipment which is owned by the beautician who rents the room and offers a range of treatments for guests including sports massage. Dining room with seating for a maximum of 56 guests at 27 tables with matching furniture and having in-out serving doors to the kitchen. Bar/lounge with good range of matching comfortable seating with a door off to a games room with a pool table and doors to the garden. Food preparation room with tables, fridge freezers and a cupboard housing a gas fired boiler. Wash-up room with commercial dishwasher and domestic dishwasher and a room off housing a further gas fired boiler. Kitchen/serving area with good range of equipment including commercial oven, large electric grill, warming cupboards, two deep freezers, deep stainless steel sink, meat slicer and other ancillary equipment. Laundry room with two tumble dryers and two washing machines and a deep stainless steel sink. bedroom 14 - family of 4 with en-suite bath wc. Bedroom 14a - twin with en-suite shower wc. Bedroom 15 - treble with en-suite shower wc. Bedroom 15a - double with en-suite shower wc. Bedroom 16 - double with en-suite wc. Bedroom 17 - treble with en-suite wc. Sea view and doors opening to pool patio. bedroom 18 - double with en-suite shower wc. Bedroom 19 - double with en-suite shower wc. Bedroom 20 - treble with en-suite shower wc. Sea views. spacious landing with built-in store cupboards. Bedroom 1 - family of 4 with en-suite bath wc. Sea view. a large bath in the corner of the room. Sea view. Bedroom 4 - double with en-suite shower wc. Bedroom 5 - double with en-suite shower wc. Bedroom 6 - double with en-suite shower wc. Bedroom 7 - double with en-suite shower wc. Bedroom 8 - double with en-suite shower wc. bedroom 10 - treble with en-suite bath wc. Bedroom 11 - twin with en-suite bath wc. Bedroom 12 - family of 5 with en-suite wc. bedroom 21 - double with en-suite shower wc. Sea view. Bedroom 22 - twin with en-suite shower wc. Bedroom 23 - treble with en-suite shower wc. Sea view. two timber staff chalets with one single and one double bed and en-suite shower wc’s. surrounding with sunbeds, tables and chairs for guests. the current owners run the hotel business as a limited company and would either be prepared to sell the limited company with its assets including hotel fixtures, fittings and furniture or would just the hotel and fixtures and fittings without limited company aspect.